It’s the surest bet in sports. What would you say if I told you about one basketball team who is 132-0 against another? Would you call it dominance? You’d be right. What would you say if I told you that those 132 games had been decided by an average of almost 25 points? That, despite three or four of those games being close, most of them weren’t even as close as 25 points makes them sound? You’d call it one of the most locked-in outcomes in the history of athletic competition. Well, since 1985, when the NCAA men’s basketball tournament — March Madness — expanded to 64 teams, no top-seeded team ever lost to 16-seed. With the 64-team field divided into four regions, and each region having 16 teams, that makes 132 times that a 1-seed had beaten a 16-seed. Actually, that was through last season. The new number is 135 times. Don’t I mean 136 times? Well, I can see why you’d think that, but I don’t. The number is 135 because the surest bet in sports finally lost. 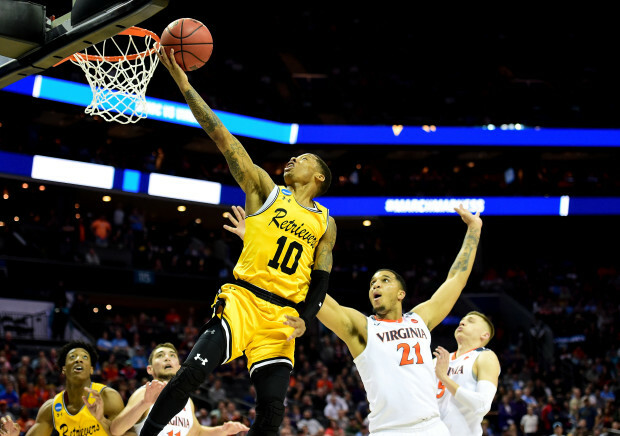 In the first round of this year’s tournament, the 16-seeded University of Maryland, Baltimore County, stunned top-seeded Virginia in the South region. And it wasn’t even close: UMBC won by 20, 74-54. Estimates are that about 2% of the 30 million or so people who submitted a bracket online picked the game correctly. That’s not very many percents. If you didn’t, though, it’s really hard to blame you; 32 years of history would have said you were right. I know that, like most people who submitted brackets this year, I picked the ones over the sixteens without really thinking about it. I didn’t even look closely enough at it to remember who Virginia was playing. It didn’t matter: they’re a one, those other guys are a sixteen. It was a sure thing. A done deal. I wonder how many of the “done deals” and “sure things” upon which we build our lives and find our security and around which we tell the stories of who we are aren’t nearly so done or sure as we’d like to believe. Careers? They can be lost in the space of one reorganization, one bad decision, one whim of one executive who wants to cut a few dollars. Health? Ask anyone with a negative prognosis how certain that is. Money? A series of bad investments, a few unexpected expenses, a downturn in the market, a lost job can change your bottom line quickly. Even the strongest family won’t be with you forever. Political parties die (just ask the Whigs). Churches change. Religious leaders disappoint. Even your own mind and body will eventually fail. Father Time truly is undefeated, eroding “sure things” until they collapse and are scattered like dust in a cyclone. We depend on them because they’re there. We can see them, hear them, use them. We can sort of take for granted that they’re part of our lives. They feel to us like insurance for a future that’s much like our present, or even better. To a degree, we can control them, or at least convince ourselves that we can. Finding our security in those “sure things” is what the Bible calls “living by sight.” And what the Bible says about living by sight is that those who are believers don’t. We, instead, live by faith. It isn’t for the faint-hearted, living by faith. There’s a whole chapter in the Bible, Hebrews 11, that talks about how difficult it can be. It names folks who found themselves in conflict with their neighbors because they lived by faith. It talks about wanderers who left established homes to obey God and go to a new place that he hadn’t shown them yet. There were people who trusted God enough to put their dreams in his hands when he asked them to, who spoke like God’s future promises were already accomplished fact, who accepted disgrace rather than power and wealth, and who weren’t afraid of powerful people who tried to silence them. “The world was not worthy of them,” is the conclusion of the writer. I know people who make that look easier than I can, but I don’t think it comes naturally for anyone. We all have “sure things” in our lives that we clutch tightly to us when times are hard. We all have moments when our faith fails, when our ability to see the invisible is obscured. That’s why we need people around us in whose footsteps we can walk: people whose stories we read in Scripture, but also people whose stories we live with them as they face the loss of even their surest things with trust, grace, courage — faith. If you’re discouraged, know that Jesus has walked his path before you, He, too, had to let go of his sure things to embrace what God had for him. It won’t be any different for us.